Ever wonder what white-tailed deer see? Many times hunters overlook critical aspects such as deer vision, causing them to be ill-prepared and ineffective hunters. Additionally, the studies regarding deer vision in relation to deer hunting get mentioned in popular hunter culture but rarely is there a decent explanation citing facts and, more importantly, not related to some sort of consumer marketing. First, in order to understand deer vision, we need to start with the basics. The visible light spectrum consists of a frequency range approximately 380nm to 750nm. This frequency range can be broken up into smaller sections. These sections of light frequency appear differently to our eyes. Furthermore, there are different types of sensory cells in our eyes capable of perceiving different frequencies. As a result, we are able to differentiate these frequencies as multiple colors. The colors of the visible light spectrum are violet, blue, green, yellow, orange and red (Figure 1-A). Humans as well as deer have two major types of photoreceptor cells in the retina of their eyes called cone cells and rod cells. Cone cells are responsible for color vision and are most effective in well lit conditions. Rod cells are more effective in low light conditions and, for the most part, don’t allow for color vision. This is why discerning colors can be difficult when it gets dark, even if you can still see an object. Most humans have trichromatic vision, which means we have three different types of cone cells functioning in our eyes. Each type of human cone cell is sensitive to either a red, blue or green part of the color spectrum, giving us the ability to perceive what we know as full color. With the exception of colorblind individuals, most of us can see the full visible light spectrum accurately (Figure 1-A). This is where the similarities between humans and deer become few and the differences many. 1. Two Color Vision: Deer have two types of cone cells in their eyes and function with two color vision, known as dichromatism, versus humans who have three color vision. Deer can sense mostly blue and some yellow hues. For the most part, everything in between these two hues appear only to them in terms of luminosity or as a black and white image, also known as grayscale. Because of this, we can assume deer cannot sense the colors red and green. Since the cone cells in a deers eye are sensitive to blue and yellow light it would be prudent to not wear clothing or have items that have these colors on them. Figure 1-B. Visible Light Spectrum As Seen by Deer. 2. Robust Night Vision: Compared to humans, deer have greater amounts of rod cells. These additional photoreceptor(s) allow them to see quite well in the dark. Essentially, the more rod cell type receptors there are in the eye, the more image data there is being sent to the brain during low light conditions. This allows deer to effectively function and remain active during full night conditions, making them nocturnal or crepuscular animals. However, rod cells don’t account for color variation. So, while deer can see well at night, they cannot differentiate between colors (other than blue and some yellow hues) like humans can. 3. Ultraviolet (UV) or Infrared (IR) Light Sensory: For humans, infrared and UV light passes out of our visible light spectrum, hence the name ultra (above) violet and infra (below) red. Humans can see light wavelengths form approximately 390-700nm. Just like humans, the cone cells in a deers eye cannot perceive the color variance in the ultraviolet or infrared spectrum (Jacobs et al., 1994). However, unlike the rod cells in human eyes, the rod cells in deer eyes are more sensitive to light in the ultraviolet spectrum. For this reason it is important to consider what types of camouflage, blaze orange clothing and flashlights you use when hunting. In contrast, deer eyes are not as sensitive to the red or infrared spectrum of light. This is because the cone cells in their eyes do not see hues of red and their rod cells stop responding to light stimulation at, approximately, the 600nm wavelength. Human eyes, on the other hand, are still sensing light until about the 700nm wavelength. 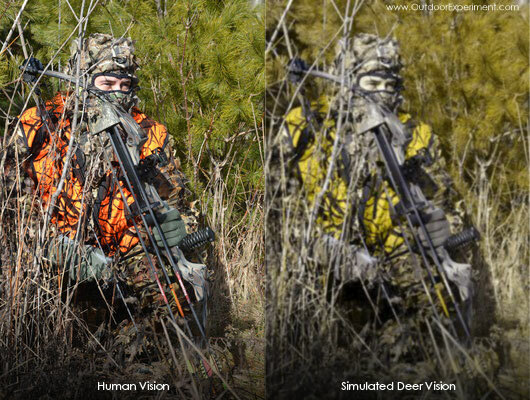 This difference in light sensitivity between human and deer eyes can be used to a hunter’s advantage. Red light can be used to aid human vision in low light conditions without alarming deer. Another advantage of red light is that it allows the human eye to stay adjusted in the dark. Thus, a red flashlight is invaluable while hunting. However, keep in mind that red light will not allow the same visual clarity as a bright white light. Blaze Orange & Camouflage: Human vs. Deer Vision. 4. Optical or Ultraviolet Brighteners: Undoubtedly, clothing can make a difference in how well a deer can see you. Typically any camouflage pattern can aid in breaking up your outline, assuming it does not contain the colors blue or yellow, optical brighteners or reflective materials. Ultraviolet brighteners commonly used in laundry detergents have an effect on how hunting clothing appear to deer. For the most part, both humans and deer are able to perceive the variation in brightness that ultraviolet brighteners make. Marketing for popular hunting products often appeals to knowledge that average hunters lack on this subject. See Ultraviolet Brighteners and Deer Hunting (Not yet posted). to learn more about this topic. 5. Larger Eyes and Pupils: Deer have a larger maximum pupil diameter than humans. Deer pupils can dilate from 3mm to 12mm. In contrast, human pupils can only dilate an average of 7mm and a maximum of 8mm. In essence, the more a pupil dilates, the greater the amount of light that passes into the eye creating a brighter image. A good comparison is the effectiveness in different types of binoculars. Generally, binoculars that have a larger exit pupil diameter and bigger objective lens will allow for better clarity during low light conditions. The same thing happens in the lens of an eye. In this case, bigger = better. Tapetum lucidum creating a noticeable reflection in the deer’s right eye. 6. Reflective Tissue: Deer have a layer of tissue in their eyes that reflect light back towards the photo-receptors. This tissue layer is called tapetum lucidum and helps deer see better during low light conditions (e.g, dusk and dawn) and makes their eyes appear to glow when reflecting light (e.g., headlights). Many other animals have this tissue layer as well. Luckily for deer, shining and shooting at night is illegal in most places. It does, however, help motorists spot deer crossing the roads at night. 7. Different Lenses: The lens in a deer’s eye are optimized for different advantages. According to G. J. D’Angelo et al. in their study of the influence of ”visual specializations” on white tail deer behavior, ”Large lens causes the optical center of the eye to be closer to the retina, which decreases the size of the image projected onto the retina. In essence, deer do not have 20/20 vision. Deer vision is likely to be significantly less acute, comparable to a human who has maybe 20/40 vision. 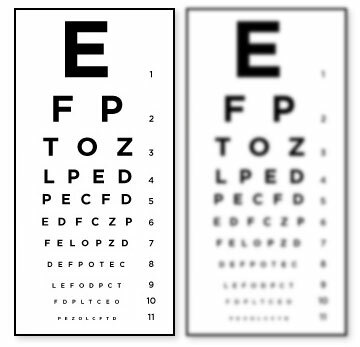 As anyone with glasses can tell you, discerning objects with less visual acuity than 20/20 vision is not all that easy. For this reason alone, it is advantageous for hunters to hold still and add camouflage to their hunting gear. Camouflage will help to break up a hunter’s silhouette, making it harder for a deer to spot him. In general any camouflage that breaks up the body’s silhouette or outline is worth wearing. My top recommendations for camouflage patterns are Realtree, MultiCam, Flecktarn (German), ARPAT and Tigerstripe. Good camouflage also includes other forms of concealment such as a ghillie (yowie) suit or 3-D camouflage. I prefer 3-D camouflage as it conceals the body much better than standard camouflage clothing but is not as cumbersome and more practical than a ghillie suit. For more information on good hunting clothing see Scientific Camouflage & Blaze Orange Research (Not yet posted). Even in plain clothes, if a hunter holds still and breaks up his silhouette and eyes, some deer may approach within yards of him in their line of sight without recognizing him as a threat. However, in the same conditions, a hunter can be a 100 yards away, move his hand and be spotted by deer. That’s because their ability to sense motion and focus on the moving object is still quite effective, similar to T-Rex in Jurassic Park, only not as extreme (or scary). 8. Eye Placement: Due to their eyes being on the sides of their heads, deer have a much wider field of view unlike humans and most predators who have eyes on the front of their heads. 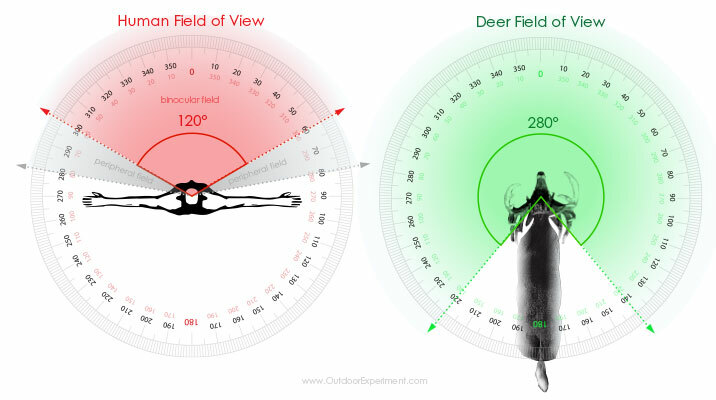 This means that deer have an approximate 280º field of view compared to humans who only have an approximate 120º field of view (see Figure 1-C). This helps deer detect motion and danger from all directions. Figure 1-C. Human vs. Deer Field of View. However, because of the location of their eyes, deer do not have binocular vision. As a result, deer see everything as relatively flat images because they lack depth perception. This is disadvantageous to them as precise focusing is difficult, which hunters can take advantage of by utilizing a natural blind. For example, if a hunter stands next to a tree or foliage, it will help break up his outline. If he stands behind the tree or foliage, it will hide him almost completely. 9. Different Processors: Another thing to consider how deer process information (in this case light) compared to humans. Needless to say, each will process the information differently. For more on this subject, see What a Predator Looks Like and Hunting Camouflage (Not yet posted).